A whimsical field guide to embroidered flowers. Working through a full growing season, from spring to autumn, the sixty-three flower varieties presented here offer a full garden of cherished blooms. From pansies and lilies-of-the-valley to poppies, zinnias, and campanulas, the flowers presented here feature buds, blooms, and roots in stunning detail and charming color combinations. As an avid gardener and seasoned embroiderer, Kazuko Aoki presents a beautiful blending of her twin passions through designs that are clearly rendered with an appreciation for intricacies and a delight in the subject. 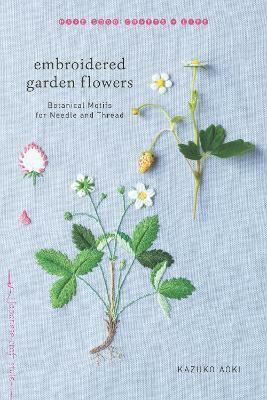 With artistic photographs, clear step-by-step instructions, and detailed diagrams, Embroidered Garden Flowers is a treasure trove that can be enjoyed by novice and experienced sewers alike.